Mikey met with his pediatric CML specialist a few weeks ago and he is doing great! The tyrosine kinase inhibitors (his TKI medication) are working and his chronic myeloid leukemia levels are very low. He starts school next month and his family is very happy. We are happy also. Way to go Mikey! Did you know that an orange ribbon promotes leukemia awareness and shows support for leukemia survivors and their family and friends? Orange also happens to be Mikey Sexton’s favorite color. 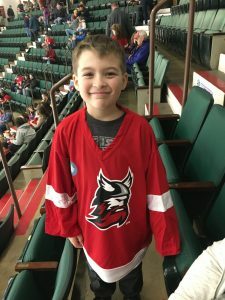 It’s a strange coincidence because seven year old Mikey was just recently diagnosed with CML (chronic myeloid leukemia) and is in need of a bone marrow transplant. CML is a rare form of blood cancer that typically affects older adults, so it is rarer still to be diagnosed with CML as a young child. It begins in the blood forming cells of the bone marrow, and eventually spreads to the blood. CML is a fairly slow growing leukemia, but it can also change into a fast-growing acute leukemia that is hard to treat. Mikey’s father, Mike Sexton, who is a corrections officer and volunteer fireman says, “he was really tired, kind of pale, and not really acting like himself.” After his diagnosis, and a week at the hospital, Mikey spent 2 weeks at home taking oral chemotherapy drugs. His doctors believe that a bone marrow transplant will be his only hope for a cure. Mikey’s younger brother was tested, but he is only a 50% match. This is where the Icla da Silva Foundation steps in. 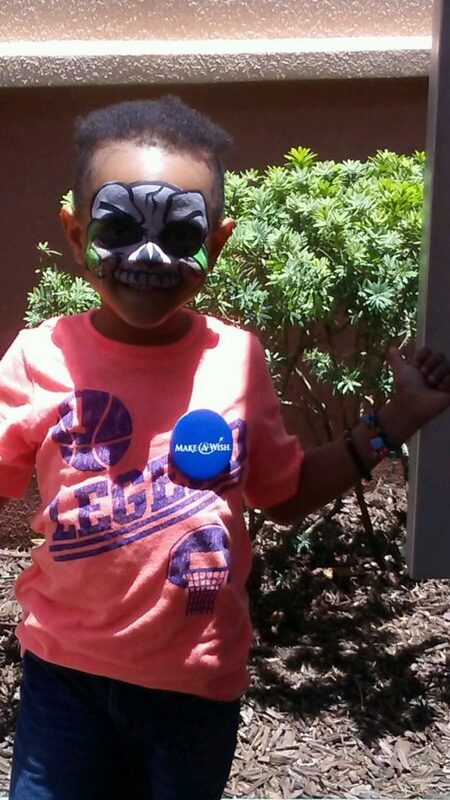 Patients like Mikey, who need a transplant, rely on us to help them find a matching bone marrow donor. We have begun working with Mikey’s family to schedule marrow drives, asking people to join the Be The Match bone marrow registry. You can join the registry by by attending one of our drives, or you can join online, providing basic contact information and some medical history. Be The Match sends out a swab kit, with simple directions to capture your HLA type, and you will be entered in the registry with the hopes of matching a patient in need of a marrow transplant. There are more than 14,000 patients with various forms of blood cancer who can be saved if they are able to find a matching donor. The online process to join the registry takes 8 minutes. If you match a patient and agree to become a donor, the gratitude and understanding that you saved a life lasts a lifetime. Another way that you can help is by spreading the word about Mikey’s story. You can share this story by using the links below, and ask your friends to consider joining the registry. If you have access to a larger group of people – through an employer, a club, a school or a church organization, you can host a drive in honor of a patient. We do most of the work, you simply have to fill out the request form here and make the introduction. You can also help the family directly by making a donation to their personal gofundme page. Mikey was deemed healthy enough to go back to school, and he couldn’t be happier. This video from his hometown Spectrum News, shows the overwhelming support received at his elementary school. Mikey is a sweet boy who loves being with his friends. 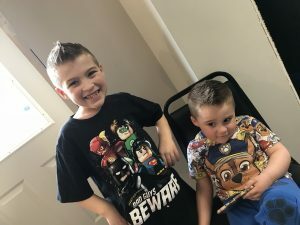 Although he was very excited to return to school, his parents have decided it would be best for him to attend ½ days, since Mikey is physically exhausted and can’t make it through a full day. He likes reading, playing hockey and being a tiger scout…and of course, he also loves the color orange. We have high hopes for a matching donor, and when the time is right, a successful transplant. Keep going Mikey! It was winter and she had a bad cold. The cold had triggered an asthma attack and her parents were worried. They took her to the emergency room. The attending doctor ordered a chest x-ray to rule out pneumonia. Veronica did not have pneumonia…but the radiologist was concerned. Her bones appeared larger than normal for a girl of her age. 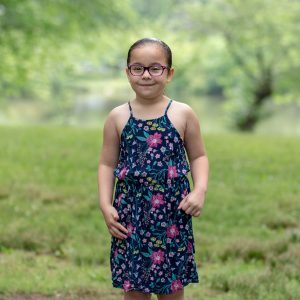 After a year of referrals to various doctors – endocrinologists, metabolic specialists, radiologists, and hematologists, after multiple rounds of bloodwork, genetic testing and numerous x-rays, it was determined that Veronica Depauli had hardened bones throughout her body. In March 2016, Veronica was diagnosed with a form of osteopetrosis (autosomal dominant osteopetrosis type 2, or ADO2). ADO2 is a rare disorder characterized by increased bone density and abnormal bone growth, which can lead to recurring fractures, vision loss, hearing loss and facial paralysis. It can also impair the function of bone marrow, because the bones are growing at a disproportionate rate, which will prevent the body from producing new blood cells and immune system cells. Veronica Depauli is a beautiful, intelligent 7 year old girl. She likes singing and art. You wouldn’t know it by watching her draw, or play with her younger sister Annabelle, that she has a rare disease. You wouldn’t know that her optic canals continue to narrow, which may result in vision loss, or that her bone marrow space has diminished, although it still continues to function. With each passing day, the severity of her symptoms continue to increase. 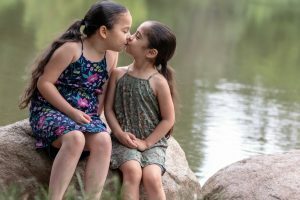 Her little sister helps distract Veronica whenever she is in pain. She brings her ice packs and coloring books and tries to get her to smile by singing. She does the best she can to help her big sister. 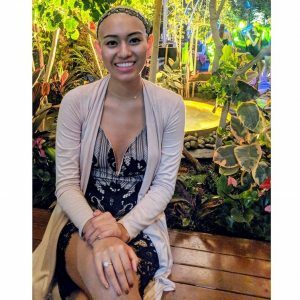 Veronica Depauli needs a bone marrow transplant. Her doctors believe it can markedly improve her osteopetrosis and offers the best chance for longer-term survival. The challenge with every bone marrow transplant is finding a matching donor. The difficulty is finding someone who has a similar HLA type to yours. HLA is a protein, or a marker, found in most cells in your body. Your immune system uses these markers to recognize which cells belong in your body, and which do not. When two people share an ethnic background, there is a better chance that their HLAs will match up and a transplant can take place. Unfortunately, there are currently no matches in the national database for Veronica. Currently, Hispanic and Latino patients only have a 46% chance of finding a matching donor. This is because only 11% of the current donor pool are Latino. Veronica’s mother, Elise, is of Peruvian/Ecuadorian descent. Her father, Federico, is Uruguayan. We need more people of Hispanic and Latino heritage to join the registry. 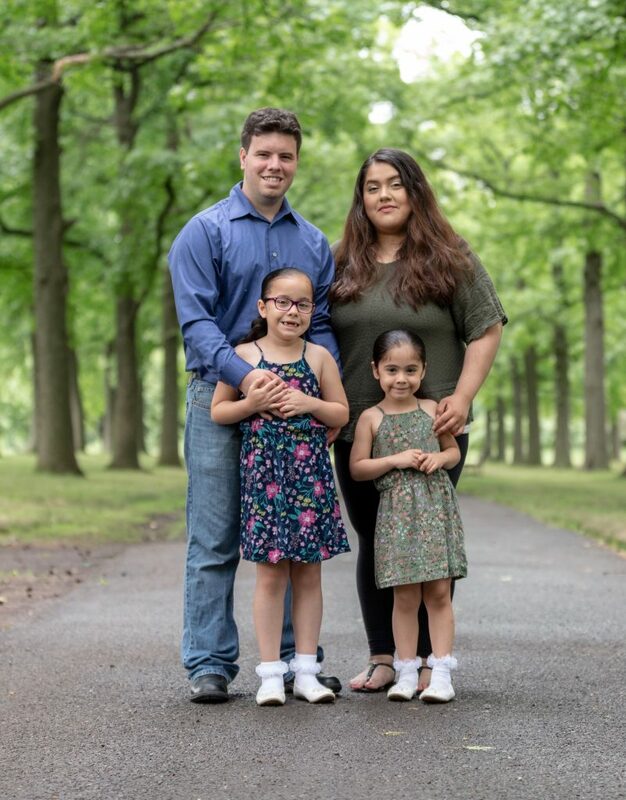 The Icla da Silva Foundation is working with the Depauli family to help find a matching donor. We are the largest recruitment center for the Be The Match registry and we focus on adding ethnic diversity to the bone marrow registry. 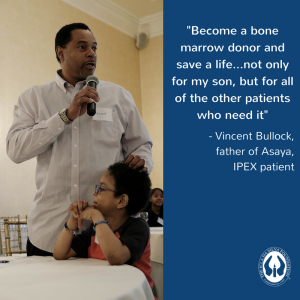 As more people of Latino descent are added to the registry, hope is increased for each of the 16,000 patients who are in need of a bone marrow transplant every year. Veronica’s parents have been very active in spreading the word and trying to get more people to join the registry. Not just for their daughter, but for all of the patients who are in need of a life saving transplant. Set-up an account with a password, and answer some basic background and eligibility questions. 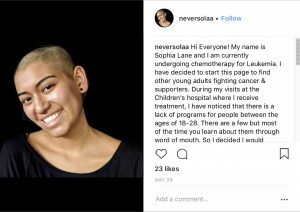 Receive a swab kit in the mail so they can get a copy of your HLA marker by swabbing the inside of your cheek with a q-tip. Return the swab kit so you can be added to the registry. If you match a patient in need of a life saving transplant, the vast majority of bone marrow donations occur through a process called PBSC, which is a non surgical procedure that is very similar to giving plasma. If you would like more information on the typical donation process, please click here. Despite thier continued challenges, Veronica’s parents hold onto the hope that a matching donor will be found. We hope so too Elise. The human spirit is alive. People are surprisingly positive and giving, kind and generous…I witnessed it first hand last weekend. Hope was everywhere. Saturday, April 14th was the 2nd annual Mix and Match luncheon sponsored by the Icla da Silva Foundation. 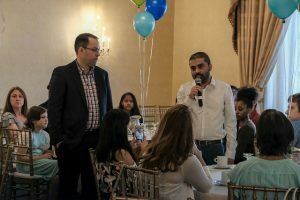 Despite the inherent challenges and dire consequences of people dealing with various forms of blood cancers, the room was filled with smiles and hope. Family members stood and talked about their involvement with Icla da Silva. 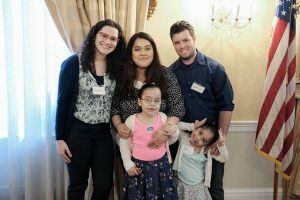 They shared stories about the loss of loved ones due to leukemia and MDS, but they still maintained focus on the importance of spreading the word about bone marrow donation and doing everything they could to help others, in the name of their father, son, daughter, husband, sister, wife, cousin and friend. 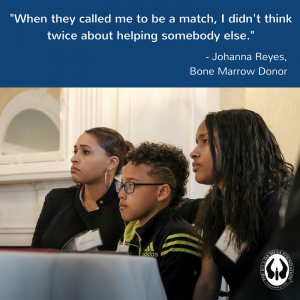 Donors talked about receiving the call that they were a match and feeling blessed by the opportunity to give life to someone through a bone marrow donation. Often, the process is not much more cumbersome than giving plasma, and they described the chance to donate their bone marrow as a privilege, as something they did not think twice about, as a way to save a person’s life. Survivors shared information about their journeys, the diagnosis, the chemotherapy, the loving support from friends and family. They talked about working with Icla da Silva and Be the Match on the search for a matching donor, and they smiled about the outcome of a successful transplant. And then there were the patients, some just beginning their journey, others surviving for longer than expected…all hoping that a matching donor could be found. Some matches are harder to find. Be the Match has is the largest and most diverse bone marrow registry in the world, but it is still not big enough, or diverse enough. The Icla da Silva Foundation focuses on increasing both the size and diversity of the registry. We work to recruit potential donors from all ethnic segments in the hope that more patients will be able to find the match that they need. Join the registry and add hope to the many patients looking for a matching donor. Please click the link Join the Registry. 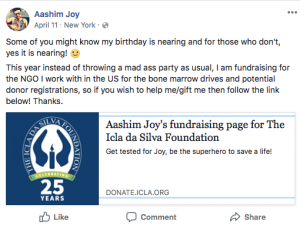 If you have the ability to connect and communicate with a group or community organization, we can work with you to schedule a Bone Marrow Drive hosted by you or your group; please enter your information using this link Host a Drive, and someone from the Icla da Silva Foundation will contact you. It only requires a small investment of time, and the promise to gather an interested crowd. The other way to provide support is financially. Even small donations help us to recruit more donors and provide support services to patients in need. We are a 501 (c)(3) and all donations are tax deductible. You can donate using this link Donate Funds. Please help us continue to keep hope alive. On October 18th, Tancrede Bouveret will meet his life saving bone marrow donor for the first time, at the Icla da Silva Hope Gala in NYC. 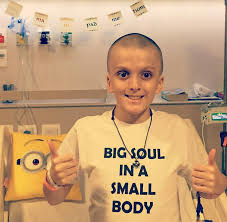 Bone marrow patients are not able to meet their donors until at least one year after a successful transplant and the meetings usually bring tears of joy. 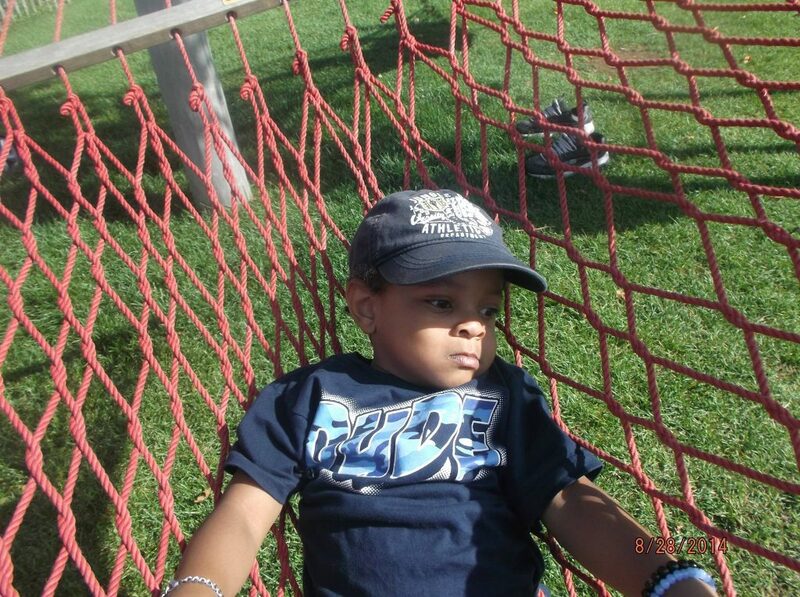 Unfortunately, Tancrède was born at the Naval Medical Center of San Diego on May 14, 2004. His father, Luc Bouveret, always dreamed of having a child, and so with the help of a surrogate in California, Tancrede entered the world. Unfortunatley, Tancrede was born premature, at just 27 weeks. He spent two months in critical condition at the hospital until his father Luc was able to take him home to Paris. Once back at home, Luc found it necessary to quit his job so that he could care for his son and give him the attention that he needed. Soon after, their family expanded when Luc met his partner, David. At the age of 4, the family moved to Sao Paulo, Brazil. Luc and David decided to have another child and engaged the same surrogate in California. Tancrede, now at the age of 6, gained a brother, Elzear. The family were living a happy life in Sao Paulo until March of 2015. Tancrede was diagnosed with Myelodysplastic Syndrome (MDS), which progressed into Leukemia. The fathers were notified that their son had less than a 10% chance of survival. The only cure is to receive a matching bone marrow transplant. Most families have the natural assumption to use a family member, but siblings only represent a 25% chance of a match and his brother Elzear was not compatible. 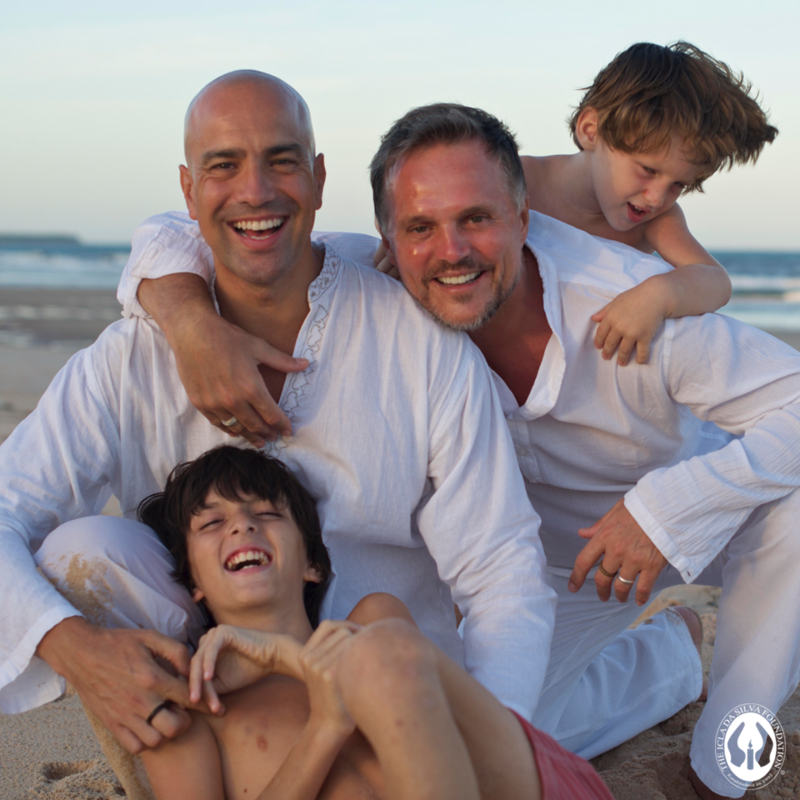 Luc and David began the search to find a bone marrow donor for their son. They held drives in Brazil and utilized social media to create awareness. They gained the attention of Brazilian celebrities and soccer players, and many people registered to become donors. They requested the help of friends and family in France and the Icla da Silva Foundation helped spearhead the search in the United States. After several months, a 90% match came through. With great hope, the fathers asked to wait a little bit longer for a 100% match. Three weeks later, in July of 2015, a 100% matching donor was identified in Madison, Wisconsin. Tancrede received his transplant on July 29, 2015. Due to complications, he spent almost 2 years in the hospital. His body needed an additional transplant of lymphocytes, which the donor agreed to, without hesitation. Tancrede is now 13 years old and despite his illness he continues to lead a normal life. 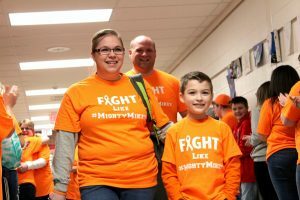 Although still in recovery, taking an abundant amount of medicines, antibiotics, monthly chemotherapy and blood treatments, he is persistent on keeping his above average attendance in school. Tancrede has a knack for learning. He speaks four languages, is socially conscious, and has his own YouTube channel. His fathers insist that none of this would be possible with the Icla da Silva Foundation and his life-saving bone marrow donor. New York (October 4, 2017) – The Icla da Silva Foundation will hold its annual Hope Gala – a fundraising benefit to support patients in need of a bone marrow transplant – on October 18, at Guastavino’s in New York City. This year’s Gala celebrates 25 years of the organization saving lives. At the celebration, Tancrede Bouveret, a 13 year-old American boy and former leukemia patient, will meet for the very first time the bone marrow donor who saved his life. Tancrede, born in California and living in Brazil, developed Myelodysplasia Syndrome (MDS) in 2015, and was told by doctors that he would need a bone marrow transplant to survive. Without a match in their family, they made a plea to the public to help them find a matching marrow donor. Tancrede’s two fathers were able to gain the support of the local community, and his story caught the attention of Brazilian celebrities, including renowned footballers Kaka and Neymar. The family’s prayers were answered in July 2015, when he received a marrow transplant from a young woman from Madison, Wisconsin. 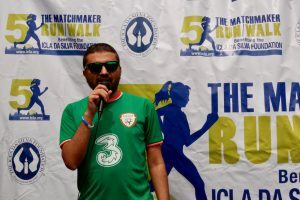 It was The Icla da Silva Foundation that initiated the donor search in the United States that resulted in the match. The two have waited over a year to meet for the very first time at the Icla da Silva Hope Gala. The The Icla da Silva Foundation has been responsible for the registration of over 500,000 potentially life-saving bone marrow donors. Since inception, the Foundation has facilitated more than 600 bone marrow transplants and assisted over 2,000 patients and their families with emotional, logistical and financial support. At the Hope Gala, the Foundation will honor Dr. Jeffrey Chell, CEO Emeritus of Be The Match, with the Legacy of Hope Award, and East River Medical Imaging, a medical diagnostic imaging center based in New York City, with the Healthcare Leadership Award for their support of the Foundation and dedication to better healthcare. This year’s Hope Gala is co-chaired by Tânae and Claudio Braz Ferro, and Renata and Claudio Garcia. Both Mr. Ferro and Mr. Garcia are executive leaders from AB Inbev. The mission of the Icla da Silva Foundation is to save lives by recruiting bone marrow donors and providing support services to children and adults with leukemia and other diseases treatable by marrow transplants. The Foundation was created in memory of a 13-year-old Brazilian girl named Icla da Silva. 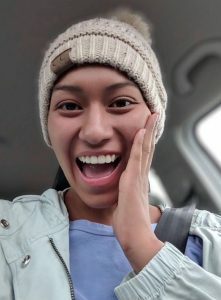 After two years of fighting leukemia, Icla passed away in New York City, where she came hoping to receive a necessary life-saving treatment: a bone marrow transplant. The young girl never found a matching donor. The Icla da Silva Foundation is 501(c)3 nonprofit.